Published: Feb. 18, 2014 at 06:03 p.m. Updated: Feb. 19, 2014 at 05:50 p.m.
Can a strong performance at the combine predict NFL success? Find out with these 10 mind-blowing stats for the NFL Scouting Combine. After brief stints in New Orleans (1984 and 1986) and Arizona (1985), the NFL Scouting Combine moved to Indianapolis where it has been held since 1987. This is the 28th combine in Indianapolis. The first 22 combines in Indianapolis (1987 to 2008) were held in the RCA Dome (called the Hoosier Dome for the eight combines from 1987 to 1994 before the building was renamed the RCA Dome). 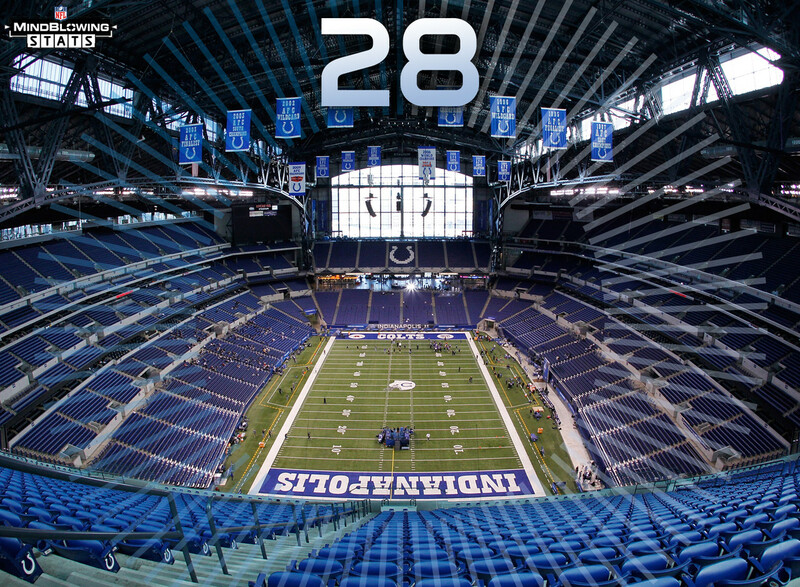 The 2014 combine will be the sixth held in Lucas Oil Stadium. Four of the five fastest 40-yard dash times since 2003 came prior to the move to Lucas Oil. Over the past eight years, NFL Network's Rich Eisen has run the 40-yard dash, with his best time coming from the 2012 & 2013 NFL Scouting Combines, when he ran matching 6.03 times. Since Rich began running the 40-yard dash in 2006, only one player has finished with a slower time - undrafted Houston Cougar offensive lineman Isaiah Thompson in 2011, who crossed the line in 6.06 seconds. Since 2002, many notable players have made it onto an NFL roster without attending the combine. That list includes Victor Cruz in 2010 (undrafted), Jay Ratliff in 2005 (seventh round, 224th overall), Wes Welker in 2004 (undrafted), Osi Umenyiora in 2003 (second round, 56th overall) and James Harrison in 2002 (undrafted). Over the last eight drafts, on average, the first player picked that did not attend the NFL Scouting Combine has been selected with the 90th pick. The earliest drafted non-combine invitees since 2006 have been Duron Harmon in 2013 (third round, 91st overall by the Patriots), Tavon Wilson in 2012 (second round, 48th overall by the Patriots), Kris Durham in 2011 (fourth round, 107th overall by the Seahawks), Jacques McClendon in 2010 (fourth round, 129th overall by the Colts), Mike Mitchell in 2009 (second round, 47th overall by the Raiders), William Hayes in 2008 (fourth round, 104th overall by the Titans), Usama Young in 2007 (third round, 66th overall by the Saints) and Domenik Hixon in 2006 (fourth round, 130th overall by the Broncos). This year, 22 tight ends were invited to the NFL Scouting Combine, the most to have been invited from that position since 2002. In the last 10 years, 17 tight ends have run the 40-yard dash in 4.60 seconds or less and all 17 have been drafted, including Vernon Davis (4.40 in 2006), Jimmy Graham (4.56 in 2010), and Jordan Cameron (4.59 in 2011). During the last 10 years, no tight end has run over a 5.00 second 40-yard dash and been drafted in rounds 1-4. In the last five years, 15 wide receivers have run a sub-4.40 40-yard dash. Of those 15, Mike Wallace is the only player to produce a 1,000-yard season (2010 and 2011). Wallace, Darrius Heyward-Bey and Johnny Knox are the only three players to have even reached 1,000 career receiving yards. The receiver with the best 40-yard dash time, Marquise Goodwin (4.27 in 2013), had 17 receptions for 283 yards and 3 touchdowns for the Bills last season. Over 20 percent of the players invited to the 2014 NFL Scouting Combine are from SEC schools, with a total of 71 players invited from those schools. Of those 71 players from the SEC, 12 are from the University of Alabama -- more than the entire MAC Conference is sending to Indianapolis (10). The conference with the second most players invited to this year's combine is the ACC with 48 players. Since 2004, 29 combine quarterbacks have been drafted in the first round of the NFL Draft. What does the average first round combine QB look like? He is 6-foot-4, 232 pounds, and runs the 40-yard dash in 4.71 seconds. In other words, Andrew Luck, who measured in at 6-4 and 234 pounds at the 2012 combine and ran the 40-yard dash in 4.67 seconds. Over the last 10 years, just 14 players not invited to the NFL Scouting Combine have been selected in the first three rounds of the NFL draft. Since 1985, when each NFL team began participating in the combine, only three players have been selected in the first round of the draft without attending the combine. Those three make up 0.34 percent of the 874 first rounders selected in the last 29 years (since the combine began). Cornerback Darrien Gordon (drafted out of Stanford, 22nd overall in 1993 by the Chargers) is the last player selected in the first round who was not invited to the combine. The only other two players drafted in the first round who were not invited to the combine are defensive end Aaron Jones (1988 -- 18th overall by the Steelers) and defensive tackle Eric Swann (1991 -- sixth overall by the Cardinals). Swann did not attend college and was not eligible to be invited under combine policy.